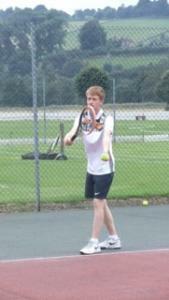 After completing a Level One Tennis Coaching Course, Ross Jillings, 17, has been coaching mini tennis at Belper Meadows Tennis Club. 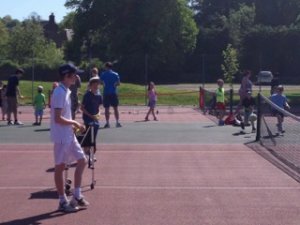 "I have played tennis from about the age of eight and when the tennis club put on a mini tennis coaching course, I was just old enough to take part. It was straight after that I then started volunteering. "I enjoy all aspects of tennis - playing, coaching and watching. I was at Wimbledon for the women's final this year and also the men's wheelchair doubles final, and I knew the players from being part of the ball crew at the Nottingham Tennis Centre for the Aegon Open and the wheelchair tennis open. "I subsequently applied for a Coaching Derbyshire bursary, which helped me be able to afford to do a Level One Tennis Coaching Course. "I have also been raising money and working to earn money to pay for the coaching course and an expedition to Peru in the summer." "In passing the Level One Tennis course, I was able to learn new skills, such as preparing lesson plans for different age groups. "I also learned the importance of clear communication. Doing those things built my confidence as a coach. Ross coaching at Belper Meadows. "I would say the best thing about being a coach is seeing the progression and enjoyment of the players. "Coaches are really important in sport and physical activity, particularly at grass roots level. To have a good, friendly coach to encourage people to stick with their sport, develop skill level and enjoy themselves is key. "I have a form of autism (Asperger's syndrome) and I sometimes lack confidence. I have to work very hard to be able to communicate well and start new activities. "When I am playing tennis and coaching it feels as if my disability has disappeared. My coach says that "tennis is good for Ross and Ross is good for tennis." "I live in Belper, only a few minutes' walk from Belper Meadows Tennis Club, so if I see the sunshine I can get straight down to play. If I'm playing and it starts raining I'm home and dry in no time at all! "For the last few summers I have been part of the Ball Crew for the Nottingham ATP and the British Open Wheelchair Tennis. "I want to carry on coaching, helping people get into the sport and get better at it. I'd like to do more courses so that I can continue coaching adults, and maybe even earn some money from it."